We pack and ship what others won't! State-of-the-art technology securely cushions and guarantees safe delivery of computers, electronics, and other high value items. During the packaging process, all ‘touch’ points (edges, corners, sharp points) of the item are packaged with a protective foam called Foam In Place (FIP). FIP is manufactured foam that is dispensed with a machine in a liquid state. While being dispensed, it expands and conforms to the object, creating a mold as it sets up. This creates a custom fit around the touch points of each piece. A gray film is placed between the item and the liquid foam so the FIP does not touch the piece being packed. 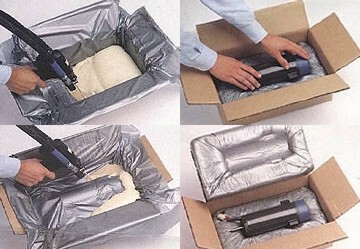 A custom box made from 275 pound test, double wall cardboard sheeting covers the packaged item piece. After boxing, large pieces are strapped to pallets for easy transferring by air or ground carrier. Customer receives the product undamaged without packing peanuts! "I needed to bring a few pieces of furniture from my parents' home in Connecticut to my home in Watertown and move a few additional pieces to Bethesda, Maryland. This was not a large project, but complicated to arrange. I had to go to southern Connecticut in order to meet the moving truck, which involved coordinating my schedule with their availability and then arrange for the drop-off at each end of the move. In spite of my schedule constraints on my part, waffling (on my part) and the overall complexity of the task at hand, Joe Fell [of Boston Pack and Ship] was invariably helpful, responsive and patient. In the end, the move went smoothly and I very much appreciated their efforts." Boston Business Owners: What’s Your 2019 Growth Plan? Are Shipping Challenges Keeping Your Small Business From Succeeding?